This waterfall chart template guides you step-by-step to construct a waterfall chart using raw data. 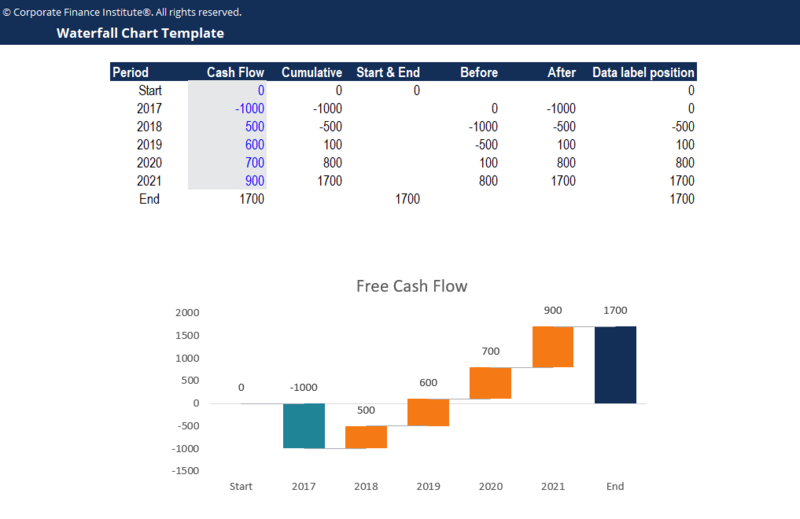 Waterfall chart is a great way to visually show the effect of positive and negative cash flows on a cumulative basis. In Excel 2016, there is a built-in waterfall chart option so it is a very simple and quick process. If you’re working in Excel 2013 or earlier version, you will have to build your own waterfall chart using the stacked column chart feature. In order to build your own waterfall chart, you first have to organize your data into a table. Use the Up/Down Bars feature in charts to create the foundation of the waterfall chart. Using the column Data label position to define the position of the data labels. Use Error Bars feature in charts to show changes between each Up/Down bar.